DENVER — Democratic U.S. Rep. Jared Polis and Republican state Treasurer Walker Stapleton won their respective party primaries Tuesday for the Colorado governor’s race, setting up a left-versus-Trump showdown as Republicans seek a seat they haven’t held in more than a decade. The liberal Polis, a five-term congressman, and Stapleton, who has closely aligned himself with President Donald Trump’s immigration and tax policies, easily defeated three challengers each in the top race of this purple state’s midterm primary. As a Democrat, Polis is an early, though far from guaranteed, favorite to become Colorado’s next governor. Colorado’s last Republican governor was Bill Owens, who served from 1999 to 2007. Centrist Democratic Gov. John Hickenlooper is term-limited. In other races, Democrat Jason Crow won the primary in suburban Denver’s 6th Congressional District to try to unseat five-term Republican U.S. Rep. Mike Coffman. Doug Lamborn, the six-term Republican congressman in El Paso County’s 5th Congressional District, easily won his primary and is a heavy favorite to keep the seat. The contest to succeed Hickenlooper topped the primary, one in which unaffiliated voters, the state’s largest voting bloc, could participate without having to affiliate with one or the other of the major parties. A voter-passed 2016 initiative allowed them to do so. Polis, a tech entrepreneur and one of the wealthiest members of Congress, advocates single-payer health care, local control over Colorado’s $31 billion oil and gas industry and lofty renewable energy goals for the state. He invested $12 million in his campaign and is a fierce critic of the Trump administration’s immigration policies and efforts to dismantle the Affordable Care Act. Stapleton, a distant relative of President George W. Bush, closely wedded himself to Trump on virtually every issue — even refusing to condemn the Trump administration’s immigrant family separation policies — except trade, where he opposes tariffs that could produce a trade war and harm Colorado industries. Stapleton has attacked Polis as someone who would chase energy jobs out of Colorado, and he also opposes Polis’ pledge to modify a constitutional amendment that severely restricts Colorado’s ability to raise taxes or spending. 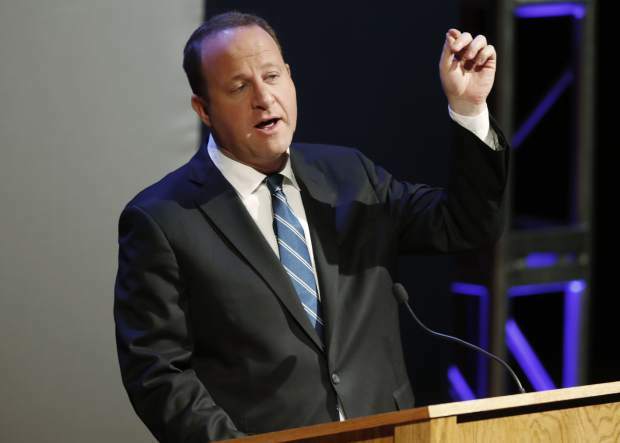 Polis argues that Colorado’s rapid population growth — 5.6 million people and counting — demands a fiscal system that allows the state to invest needed billions of dollars in its underfunded infrastructure and public education. A former state board of education member and founder of English-language schools for immigrants, Polis defeated former state Treasurer Cary Kennedy, who was endorsed by Colorado’s teachers unions. Former state Sen. Mike Johnston, an educator and gun control advocate, and Lt. Gov. Donna Lynne also ran. A preliminary count suggested that unaffiliated voters, Colorado’s largest voting bloc, helped produce a surge in turnout by participating in either the Democratic or the Republican primary. Early numbers showed more than 30 percent of active voters casting ballots, a high percentage for a non-presidential election year. Associated Press writers Brian Eason and Kathleen Foody contributed to this report.